Asheville is best known for its laid-back vibe, craft beer, and stellar music scene, but this North Carolina metro is more than a hipster cliche — and has far more to experience. Located in the Blue Ridge Mountains, you can find a bit of everything here. There are luxurious hotels, gourmet dining, and outdoor spots for offbeat activities like bellyaking (think kayaking and swimming all in one). Whatever your interests are — art, culture, food, booze, etc. — you can find something to enjoy in Asheville, from the River Arts District to the peaks of the Blue Ridge Parkway. Molly Harris is a freelance travel journalist and a social media consultant. 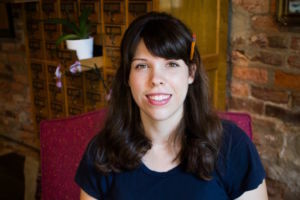 She has written for Lonely Planet, BBC Travel, Fodor's Travel, Atlas Obscura, USA Today, and others while reporting from Central America, North America, and Europe. Molly grew up spending her weekends in Asheville and the Blue Ridge Mountains. She now divides her time between the United States and Croatia, where she co-teaches a travel writing workshop. To this day, she never passes up the opportunity to eat at Village Wayside Bar & Grille or Rhubarb, and she loves exploring the latest agricultural and restaurant developments throughout Asheville. There’s no bad time to visit Asheville. The region has a mild Southern climate that’s kept steady in part by its location in a valley in the Blue Ridge Mountains. Though still warm, summer temperatures are mild compared to the rest of the South. Fall brings colorful foliage, winters welcome enough cold weather and snow to have a little fun in without being overwhelmed (plus awesome opportunities for getting muddy on a dirt bike), and spring days are brisk and fresh with rows of vibrant tulips. If you’d like to avoid any crowds, stay away from the city in the fall when motorists and leaf peepers are in full swing along the Blue Ridge Parkway and the many hiking trails. Other than that, visit Asheville whenever you have a chance. With a community that is as active as Asheville's, there are constantly music, food, and beer festivals to keep an eye out for. "Bless your heart." — This expression is all about the body language, tone of voice, and inflection. It can signify everything from a sugar-coated dig at your expense to a true term of endearment. "Short end of the stick." — To come up short or be treated unfairly. "Happier than a dead pig in the sunshine." — To be ecstatic or over-the-moon happy. "Finangle" — Finangle is to get your way by any means possible, even if dishonest. "Fixin' to" — Fixin' to is the equivalent of saying you’re about to do something. "Fit to be tied." — An expression of frustration or aggravation. While using a ride-sharing service like Uber of Lyft is an easy and convenient option for short trips, driving your own car is the best option if you’re not drinking. There are plenty of parking options downtown. Public transportation is minimal, but there is a bus system, ART (Asheville Redefines Transit), which has seven hybrid buses and 23 biodiesel buses. Monday through Saturday, the routes run from 5:30 AM until 10:30 PM, and from 8:00 AM to 6:00 PM on Sundays. Download the Transit app for location updates and times. The fare is $1 per ride or $9 for a ticket booklet of 11 rides. Asheville is an exceptionally safe city, though use standard caution after dark when downtown and in the parks. Common sense will take you a long way in Asheville and its neighborhoods. Asheville might just be the top outdoors town in America. Here’s why.